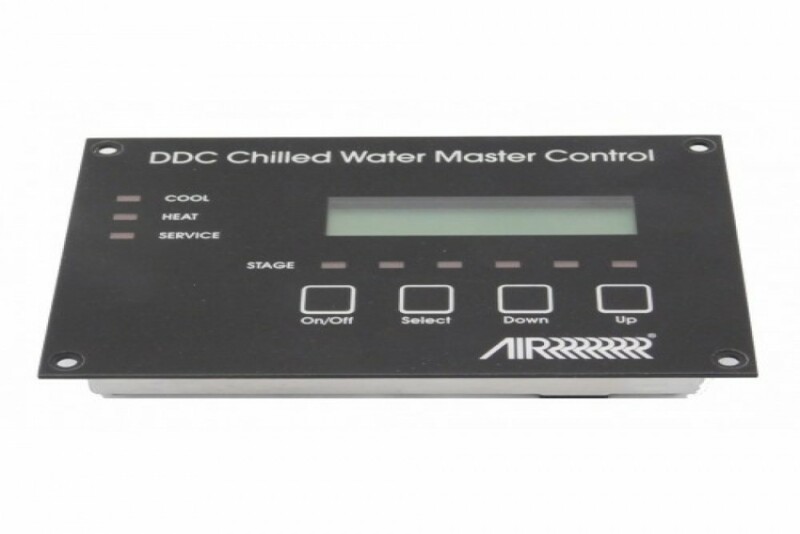 Marine Air Chilled Water Control - Display CWMC Black. Provides central control for chillers with up to six stages, optimizes compressor operation, displays water temperatures, compressor run times, diagnostic faults, and more. Circuit board is coated for high resistance to damage and corrosion. Meets or exceeds applicable ABYC, US Coast Guard regulations, and CE directives. Dometic MFG#: 334619 Display CWMC Black - Marine Air Chilled Water Control The Chilled Water Master Controller (CWMC) is a microprocessor-based controller designed for the precise monitoring and coordination of Digital Diagnostic Controllers (DDCs) for multiple chilled water systems on a boat. The control unit provides central control for up to six chillers via interfaces with the individual DDC on each chiller. It controls all of the heating and cooling functions for each chiller, as well as operation of the seawater and chilled water pumps. It optimizes compressor operation by automatically changing the lead compressor to evenly distribute run time. The two-line lit LCD display provides a scrolling read-out of system status including inlet and outlet water temperature of each stage, mixed outlet water temperature of the system, compressor run times, and diagnostic faults including refrigerant high and low pressure, flow switch, low voltage, freeze warning, and high water temperature limit. It also interfaces with a PC via a serial port permitting remote control and monitoring. The PC software also permits the system to be programmed in several different languages. Note that a PC is optional—not required—and the software is available on request. The entire assembly is grounded and protected against static interference and RF noise. The circuit board is conformally coated to provide high resistance to external damage or corrosion. A display cable with phone-type modular jacks connects the display to the circuit board. The circuit board has two display jacks. One jack is used for the display local to the chiller the second jack allows a second display to be remotely installed on the bridge or elsewhere. Non-volatile memory stores all user-selectable parameters indefinitely during operation or any power failure situations. Internal self-diagnostic programs provide complete electronic checks of all lights, sensors, keys, and circuits. The CWMC controller meets or exceeds applicable ABYC, U.S. Coast Guard Regulations and CE Directives.